Corticosteroids have been used for over half a century to treat various inflammatory disorders; however, their use in many pediatric conditions remains controversial. This issue reviews evidence on corticosteroid treatment in acute asthma exacerbations, croup, acute pharyngitis, anaphylaxis, acute spinal injury, and bacterial meningitis. While corticosteroids are clearly indicated for management of asthma exacerbations and croup, they are not universally recommended for potential spinal cord injury. Due to insufficient data or conflicting data, corticosteroids may be considered in children with acute pharyngitis, anaphylaxis, and bacterial meningitis. An otherwise-healthy 3-year-old boy presents to the ED after awakening in the middle of the night with a barky cough, gasping for air. His mother denies other symptoms and states that foreign body aspiration is unlikely. Upon arrival to the ED via ambulance, the boy continues to have a barky cough and inspiratory stridor with agitation, but no stridor at rest. His physical examination is otherwise unremarkable and his airway is patent, without any evidence of compromise. What are the next steps in the management of this patient? Are corticosteroids indicated in this situation? If so, which one should you prescribe, and at what dosage? A 13-year-old adolescent girl with a past history of recurrent tonsillitis presents because of progressively worsening pain, increasing dysphagia, decreased oral intake, muffled voice, and unremitting fevers, despite being on an appropriate oral antibiotic. The girl states the illness began with a sore throat, headache, fever, and abdominal pain 4 days ago. On physical examination, she has 4+ right tonsillar enlargement with exudate. Her rapid strep test is positive. A CT scan was ordered to rule out deep space infection, and it showed no sign of phlegmon or abscess. The girl's airway is patent. You begin to consider how you should manage this patient. You decide to consult ENT, and they recommend changing the antibiotic and administering a dose of corticosteroids. Do you agree that corticosteroids are warranted? If so, which corticosteroid should you prescribe, and at what dosage? A 15-year-old adolescent boy presents with a stiff neck and worsening severe, persistent headaches; altered mental status; and fevers for a week. He has been previously healthy, but is unimmunized. He has no nausea or vomiting, and no vision or hearing concerns. His physical examination is positive for meningismus, Kernig and Brudzinski signs, and altered mentation. Although the patient is altered, he is able to control his own airway. Lumbar puncture analysis is suggestive of bacterial meningitis. Should you consider a dose of corticosteroids? If so, which one should you prescribe, and at what dosage? The corticosteroid class of drugs provides some of the most important synthetic glucocorticoids, and have been used in many types of treatment since the 1950s.1 Despite the half-century of corticosteroid usage, there is still much debate about their use in many pediatric diseases. This issue of Pediatric Emergency Medicine Practice reviews the mechanisms of corticosteroids and the evidence-based role of corticosteroid treatment in a variety of pediatric conditions. A review of the literature was conducted using PubMed and the Cochrane Database of Systematic Reviews. The search was performed using the terms asthma, wheezing, croup, pharyngitis, acute spinal injury, anaphylaxis, allergic reaction, meningitis, corticosteroids, dexamethasone, prednisone, prednisolone, fluticasone, hydrocortisone, budesonide, cerebral thrombosis, gastrointestinal bleed, bacterial tracheitis, and growth restriction. Over 150 articles were reviewed, 93 of which were chosen for inclusion, including a number of case reports, clinical reviews, and retrospective and prospective controlled studies. Patients with mild croup can progress and develop stridor, in addition to hoarseness and a barky cough. Once the child has stridor, corticosteroids should be given. The adjuvant use of corticosteroids will allow the patient to have additional therapeutic coverage for up to 72 hours (if using dexamethasone) and will decrease the incidence of return visits, the need for further treatment, or admission. The efficacy of corticosteroids for pharyngitis pain relief has not been demonstrated uniformly, and there is currently insufficient evidence to endorse routine use. Corticosteroid use for acute spinal cord injury is no longer recommended. The only evidence of benefit was found if corticosteroids were given in the first 8 hours after injury. To help the reader judge the strength of each reference, pertinent information about the study, such as the type of study and the number of patients in the study is included in bold type following the references, where available. The most informative references cited in this paper, as determined by the author, are noted by an asterisk (*) next to the number of the reference. For children hospitalized with asthma, experts recommend oral prednisone/prednisolone at 1 to 2 mg/kg/day (max, 60 mg/day), in 2 divided doses, for 3 to 5 days. For children with asthma who present to the emergency department (ED), 1 to 2 daily doses of oral dexamethasone 0.6 mg/kg have been shown to be equivalent, with better tolerance and compliance. Inhaled corticosteroids are indicated for long-term control of asthma but are not efficacious in acute exacerbations. Systemic corticosteroids are indicated to improve morbidity and decrease hospitalizations for croup. Oral dexamethasone therapy is preferred, at doses ranging from 0.15 mg/kg to 0.6 mg/kg (these doses have been shown to have equal efficacy). 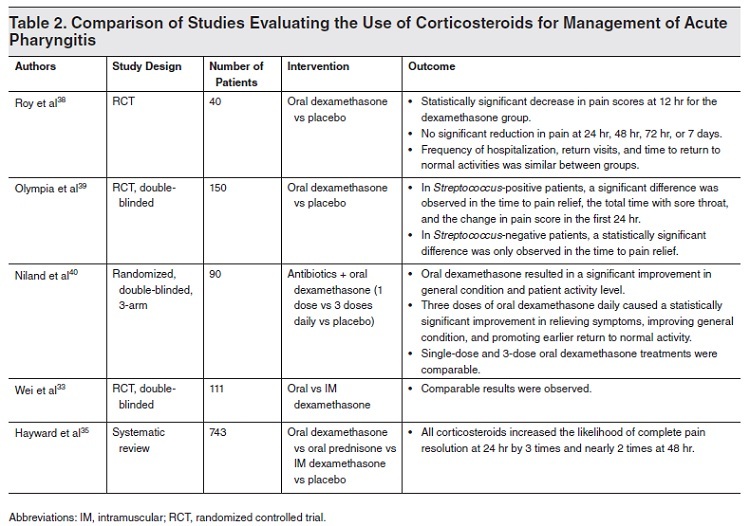 List the circumstances and conditions that warrant the use of corticosteroids, including the appropriate route, dose, and frequency of administration. Identify which conditions have theoretical, but not proven, benefits of corticosteroid use. Discuss the common adverse effects of corticosteroids in the pediatric patient. Date of Original Release: March 1, 2018. Date of most recent review: February 15, 2018. Termination date: March 1, 2021. Specialty CME: Included as part of the 4 credits, this CME activity is eligible for 4 Pharmacology CME credits, subject to your state and institutional approval. Faculty Disclosures: It is the policy of EB Medicine to ensure objectivity, balance, independence, transparency, and scientific rigor in all CME-sponsored educational activities. All faculty participating in the planning or implementation of a sponsored activity are expected to disclose to the audience any relevant financial relationships and to assist in resolving any conflict of interest that may arise from the relationship. In compliance with all ACCME Essentials, Standards, and Guidelines, all faculty for this CME activity were asked to complete a full disclosure statement. The information received is as follows: Dr. Thabet, Dr. Greenfield, Dr. Cantor, Dr. Saulys, Dr. Sellinger, Dr. Claudius, Dr. Horeczko, Dr. Mishler, and their related parties report no significant financial interest or other relationship with the manufacturer(s) of any commercial product(s) discussed in this educational presentation. Dr. Jagoda made the following disclosures: Consultant, Daiichi Sankyo Inc; Consultant, Pfizer Inc; Consultant, Banyan Biomarkers Inc; Consulting fees, EB Medicine.